The new bike all started last year when I saw a picture on twitter of the new Sync coming out from Kinesis. I automatically thought it was the perfect bike for Roz as she liked 29ers but couldn’t handle them in rough terrain but also didn’t like the slowness of a 26”. Even though I tried to make a point with a small guy on big wheels being able to ride hard and fast, I struggled in tight bends and had to use some trials skills to get through without dabbing. This got more and more frequent with the bigger rides that I was starting to do. I only decided to buy a Sync when I saw the picture of the first production bike. I’ve always wanted a Ti hardtail and this mixed with the eccentric compatible PF30 BB, 142 rear end, tapered headtube and 31.6 seatpost all added up to be a perfect combo. I’d also been sold on all the marketing hype with the new wheel size. I wanted to try it for myself. So that was it. It was decided. I was getting a Sync. Kinesis and Morvelo wanted to make a video. They had decided it was going to be in the lakes and it was for all day big mountain riding – suited me pretty well! The bikes were going to be the FF29 and the Sync. As I’m the little guy I’d be on the smaller wheels and as only a small percentage of people actually ride singlespeed – it was to have gears for the video. I’ve not had gears for over two years now on an MTB but I was excited by the fact of looking for new parts. It was always going to be single ring at the front. I went for a sram type 2 rear mech and wanted to try and get away without using a chain guide. I first tried a 32t praxis ring with a small hope chain guide. It was OK but the chain still came off and the ratio was too small. Next was an fsa 36t ring. Ratio was better for most stuff but still wished I had a little more for some of the big climbs so I could stay seated (I know – I never thought I’d be saying that again!). The chain also kept coming off on really rough ground. So I looked into it a little more and decided to go for a narrow-wide chainring (XX1 style) in 34t. There were a few brands doing aftermarket narrow-wide chainrings but it came down to two options. The race face or the absolute black chainring. The race face was cheaper but something didn’t look right. So it was an easy choice in the end and I went for the absolute black ring. Ever since it went on I didn’t have any problems. I’m starting to question if I need to have the chain guide at all! I’ve later gone and put one of their spider-less chainrings on a set of x9 cranks which looks pretty sick for singlespeed! The rest of the build was a mix of lightweight all mountain kit. X-fusion 120mm 650b forks, x-fusion sl dropper post, gripshift, kinesis strut carbon bars, arch rims on hope straight pull hubs, fsa carbon chainset. Total weight is currently at around 24lbs (the same build as what was used on the video shoot). 650B / 27.5 – WORTH ALL THE HYPE? So I’ve now had chance to use the 650b wheels quite a bit. There’s pros and cons. Cons – I don’t feel as fast over rough terrain in a straight line. I’m not sure if this is true or not but I think I’m riding slower than I was with 29er wheels. Pros – the ability to turn in corners and the fun-ness on the descents. It’s so much more lively and fun. For XC, I’ll still keep the FF29 for racing and longer endurance rides. But for all mountain and fun ‘training’ rides, there’s no other choice than the smaller wheels and more fun riding the Sync offers. It still begs the question – will this wheel size now suit Roz better? I’m not sure I’ll get the sync back if I let her have a go… we’ll have to wait and see. 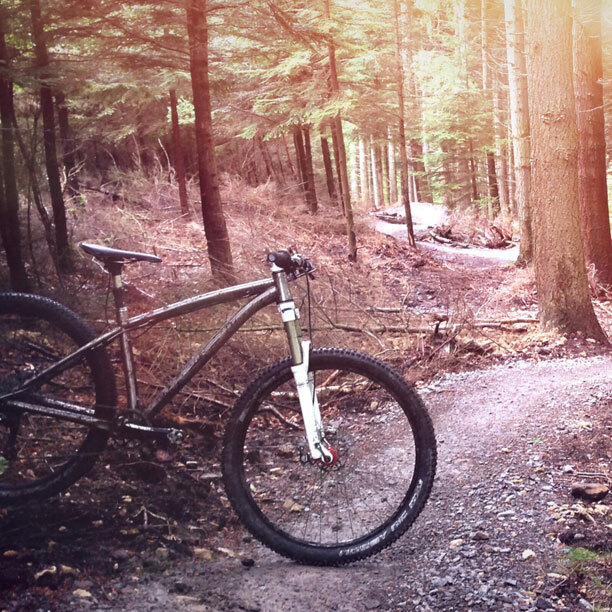 The video is now all done and I’m debating if I should keep it with gears or convert it to singlespeed for the winter… I’ve not decided so I’ll keep riding with the gears for now and have the FF29 built SS.